Tobacco use has a significant negative impact on oral health. People who use tobacco are three times more likely to have severe periodontitis (gum disease). Dental professionals have an advantage in identifying patients who use tobacco since oral diseases associated with tobacco are visible. Tobacco use cessation services provided by dental professionals have a significant positive impact on quit rates. There are multiple competing priorities that you deal with in your dental office. 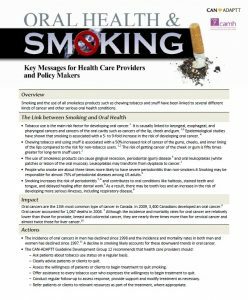 In order to gain support for the integration of tobacco dependence interventions into your dental practice, it is important to incorporate evidence into your planning tools and discussions with decision makers. Evidence-based examples and tools exist to help you to create an office system for talking to your clients about quitting tobacco use. 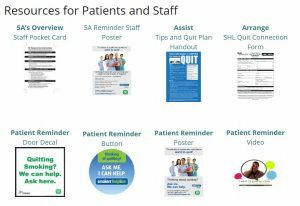 Incorporating an office system to talk to your clients about quitting tobacco use can ensure that all clients are being offered support to quit from all members of the dental team. 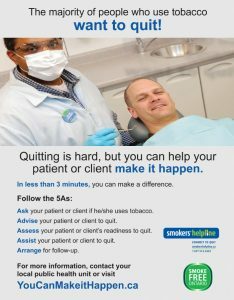 Every member of the dental team can play a role in providing tobacco cessation support for your clients. 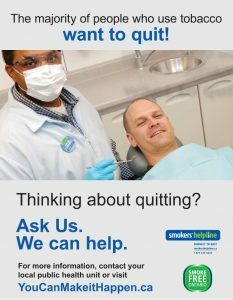 Dental professionals are considered a credible source of information by patients – you can help your patients to quit smoking, even with just a few minutes of your time. Training opportunities for Brief Contact Intervention with clients, as well more intensive interventions are available. A CAMH webinar series, “Essential Knowledge and Skills for Tobacco Dependence Treatment in Dental Practice“, specifically for dental practitioners to be able to provide practical knowledge and skills around smoking cessation interventions.